Fondly called the Venice of the North or the ‘village without roads’ – this beautiful escape tucked away in the Netherlands, Europe is nothing like quite other. Located in the Dutch province of Overijssel, it is truly a break from the hustle bustle of city life for those looking to holiday in the laps of nature. The Giethoorn village Netherlands has a total population of only 2,620. Uniquely still and peaceful, loudest sounds here are that of a noisy bird chirping or a duck quacking. Thus if you’re looking for silence and calm, it just doesn’t get better than Giethoorn. It, in fact, is a beautiful glimpse into rural Holland and the charming Dutch countryside. 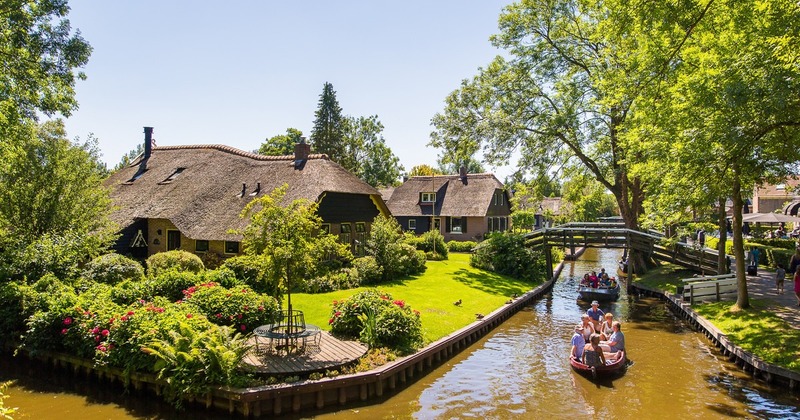 Calm, serene and mystical – Giethoorn is straight out of a fairytale. However what makes the village Giethoorn ever more unique? Imagine literally living on and moving to and fro via water. Boating past vintage thatched houses and lush green farmlands on a delicately stunning network of canals and waterways. Passing through and under 180+ exquisitely arched wooden bridges to reach your destination or even buy groceries! Yes, this is the day-to-day lifestyle of Giethoorn and the key mode of transport used by locals. In the old Giethoorn, there were no roads at all. Peat lakes connected small little islands and the locals would use the waterways to travel and to and fro in punters (traditional Giethoorn boats). Today narrow cycling paths have been built to border the canals on each side. However, some houses and sites still remain inaccessible by road. In fact even today one would need a boat to explore the whole of Giethoorn. The wooden bridges are mostly the only way to reach all houses here. As you tread on the bridges, you shall have to stop and admire in awe the beautiful views of the mystical land in front of you. Lots of lush forestries, expansive farmlands, little waterways for transportation and arched bridges crisscrossing through these canals – one would only imagine the existence of such a place in Enid Blyton books during those childhood days…isn’t it? What’s more? The village still remains untouched by modernization and the qualms of tourism. Still raw and authentic. It represents something inherently different as a place, an experience so unique that the sheer charm of being in this fairytale land shall leave you mesmerized and rejuvenated. By Air: the easiest way to reach Giethoorn is by taking a flight to Amsterdam. The village is about an hour and a half (62 mi) drive from the Amsterdam Airport Schiphol. By train: You can choose to take a train from Amsterdam to Zwolle (a neighboring city to the village Giethoorn). Or take the train from Amsterdam Central Station to Amersfoort, and from Amersfoort, another train to Steenwijk. Then onwards you will require taking a bus to Giethoorn stops. The whole journey shall take you around two and a half hours to complete. By Car: If you know how to drive and are of legal age, this would be the best option. A great add on is that the Dutch countryside is stunningly picturesque for a road trip. Take a car from Amsterdam to Zwolle (90-minute drive) or all the way to Giethoorn. From Amsterdam, you got to take the highway A1-E231 to the A28-E232 by car. You can drive to the village; however, you’d had to park your car around the village center on arrival. Hire shops in the village rent out bikes for land explorations. You would need to hire an electric boat (super easy to operate) to access all places of Giethoorn though. Paddle boats and ‘whisper boats’ (boats making no or minimal sounds) are also rented out from hire shops for traveling to and fro. However, if you want to go the local way, using the bunters for transportation is but essential when here. Note: Compare rates across different punters so as to avoid being over-charged. 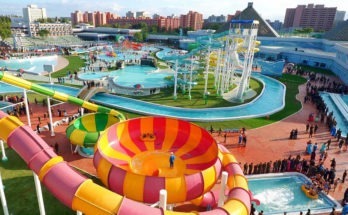 The entire water-based village in its structure and feel is quite the attraction itself. However, amongst the key activities to indulge in, a boat tour, of course, tops the list. The best way to experience this mystical village is via a canal tour. The guides shall take you to all the historically important farmhouses and locations. They shall be sharing insightful secrets about this beautiful little Holland wonder along the way. To explore the village on a cycle or by foot is one thing, but if you miss out on the point of view one gets from being on the water – you’ve not really unfolded Giethoorn in all its glory. Thus gliding past on waterways, through bridges and using the canals to commute across ancient farmhouses is imperative to experience. During the season time, the village is thronged by tourists leaving no boats free, so make sure you book your first thing in the mornings. Is the quaint and pretty getting too much for you already? How about going a little crazy and fun? 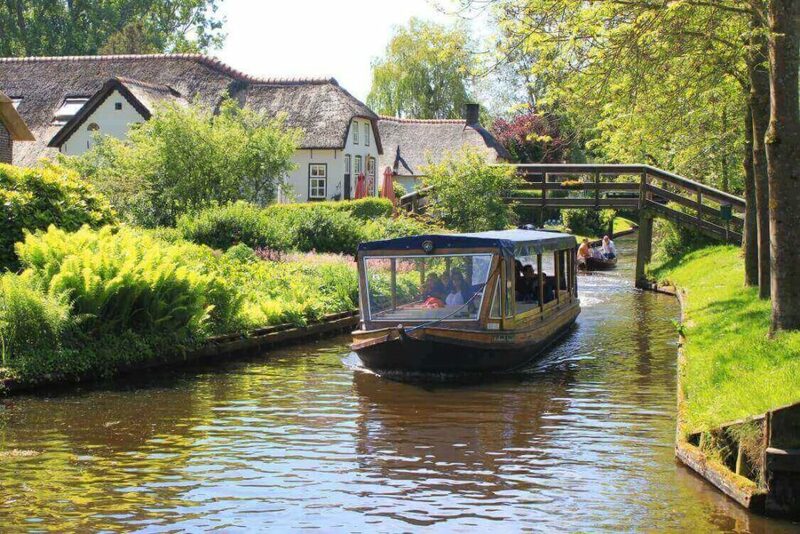 Get into an inflatable water ball instead of a boat and this can be your ride for the day through Giethoorn’s water-ways and lush landscapes. Yes, trapped inside this transparent huge ball, you can actually walk on the water of canals, roll over for insane thrills or simply float! Cycling around the village farmlands is another activity that you must indulge in. While on land, bike your way through the expansive Dutch farmlands getting up and close to the animals found here. Dutch countryside as everyone knows is nothing short of magical. Think to explore limitless green fields amidst the fresh country-side breeze. If you’re a sucker for museums and would love to explore the history behind the village Giethoorn, head to Het Olde Maat Uus. This museum has interesting exhibits on how ancient farmhouses of Giethoorn actually looked like hundreds of years ago. To discover a treasure-house of widely distinct minerals and gemstones, tour the Museum de Oude Aarde. You can also visit the Histomobil museum if you still have extra time on your hands (especially great for all car-lovers out there). It houses a vast collection of old automobiles – cars, carriages, and motorbikes. Apart from the above, there is a shipyard, art exhibitions and a multitude of cafes and eateries. Dine with a difference at the charming canal-side restaurants on the water’s edge. These rent out small electric boats for customer-accessibility. Lots of other quaint cafes are hidden all around the islands. For fine dining, a popular choice is the De Lindenhof (2 Michelin starred). Grand Café Fanfare is an iconic Giethoorn legacy that most tourists visit before leaving the village. Historical buildings and churches of the Giethoorn village are where you need to head for distinctive architecture and culture-rich sightseeing. 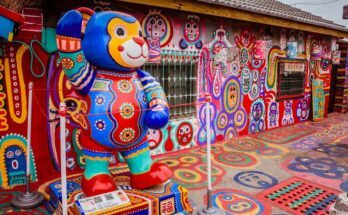 For those traveling in families, there is plenty of children activities too to keep the kids busy and entertained. Zwolle is Overijssel’s capital and a must visit for those having extended days in hand. It’s said that each building here shares a unique historical tale of its own. You can also visit the nearby district of Ommen. Go to Diepenheim, a town encompassed by five castles. Blokzijl houses great history in the forms of age-old castles and churches. Are you a true nature lover? Do not miss out on the National Park De Weerribben-Wieden. An abode of beautiful flowers and plants, canals and ponds – you shall lose yourself in the natural beauty all around. More obsessed with adventure and thrill? Take a trip to the Slagharen amusement park for an action-packed day. Netherlands season time is anytime between April to October. August is the busiest month at the village, so if you’re actually looking for peace and to avoid throngs of tourists, plan your stay accordingly. During winters, the weather conditions can get quite harshly adverse. However, for those brave souls who would still want to risk it, Giethoorn is actually even more mystical at the time. Yes, the canals, lakes, and waterways remain frozen allowing one to ice-skate on them. The whole village turns into little ice-skating rings. Thus even during winters, Giethoorn village remains a popular holiday spot for these reasons and more. Pick accommodation amongst the many hotels located right on the water’s edge. This shall accentuate your experience at Giethoorn immensely. Traveling to and fro in that case is also easier (even during winters). Hotel Giethoorn is a popular property along the canals and just 3 km from the center. You can also search on Airbnb for high-rated budget accommodations at the village. The Black Sheep Hostel is also a good option for those who are comfortable with shared bathrooms and are looking for cost-friendly stays. • Cars are not usually allowed in the village premises. You have to park them on your arrival at designated places. • Giethoorn is shockingly popular amongst Chinese tourists. Chinese tourists alone per annum amount to somewhere between 150,000 and 200,000 in numbers. • Despite being so tiny, this wondrous village now enjoys a competitive spot on the Monopoly special edition board (An achievement that many locals are supremely proud of)! • The first to settle in the village were Franciscan monks of the 13th century. • Peat harvesting is what gave birth to the village, creating lakes and water formations. Peat harvesters built their settlements on the islands between these waterways and started moving to and fro in narrow boats pushed forward via long poles (punters). They created canals to transport peat. • Giethoorn gained popularity only in 1958 after the famous comedy film ‘Fanfare’ was shot here. • Even today, the daily post is delivered by Punters in Giethoorn! Locals use punters as their traditional means of transport.